This week I went up to the Columbia Gorge and shot some time-lapse on my EOS 5D MkIV for the Blog. I forgot to mention in the video, that for a preset like this, choose the settings that you would normally use for a portrait. Then in the split toning, choose an orange color with saturation around 10 for the highlight. Then choose some sort of teal color with a saturation around 10 on the shadow. Didn’t plan on doing this sort of vlog, had something very different in mind, but sickness prevented that. Balancing flash with ambient light is quickly becoming one of the short list of skills that most define me in my own mind. This article I’ll discuss more the creative decisions than the technical. The method I usually use, unless time makes this impossible is to manually set an ambient exposure that gives the look I want. At this time I need to make the main creative choice; do I want the flashed subject to be brighter than the overall image, or use the flash as fill. If I want the flashed subject to be brighter, than I set the overall exposure to be a little dark, possibly as much as a stop. If I’m using the flash as fill, then I set a normal looking overall exposure. Then you set the flash. If I’m using on camera speedlights, I use the E-ttl method. If I’m using off-camera then I set it manually. I am considering upgrading to Profoto Off Camera Flash system, if I do that I’ll use the method where you set the initial flash power with ttl and then tweak it to give the effect you want. Finally, one has to consider the flash modifier used. I usually use something that softens the flash, softbox or beauty dish, but you need to look at the ambient and consider how you want it blend. I have no idea why, but I always get some relief from any mental anguish from converting an image to black and white. There is something about eliminating the color from an image and creating drama through tonal contrast and separation that soothes my mind. The secret to a compelling monochrome image is usually contrast. In monochrome, there are two ways to create contrast; there is contrast the same as in the image before you make the conversion and then there is separating tone based on color by using color filtration in the editing software. The second method, is always foremost on my mind when I shoot for b&W, which I rarely do. My method usually means that I sort through my existing images looking for one that will look dramatic after allowing for the color filtration etc. For the process, I use Silver Efex Pro2, now available for free from Google. It is easy and powerful. I’ve tried to get similar results just as a test in Lightroom, and it takes a lot of work, but honestly can be done. Silver Efex Pro2 comes with such a great variety of presets that it is usually a matter of choosing a preset and then making tweaks. I rarely go with the preset alone; doesn’t provide the exact look I want, and deprives me of some of my therapy. My most used preset these days is the High Structure (smooth). I usually apply a yellow or orange filter to it, red is usually too contrasty. In most pics, yellow, orange, red filters provide increasing contrast as you move through the list. This is dependent on the color makeup of the image however and sometimes blue or green are the appropriate choice. One thing to watch for is that due to some characteristic of digital images that I don’t understand, blue usually will make noise more visible. If you want a closer look at these images look at this gallery. I do tend to prefer images with a natural background, however, images on white can be very useful. Still, I had never experimented with doing this with vehicles, because the standard way would require enough costly logistics that in my current financial situation, it wasn’t too realistic unless someone hired me to do it. Then one day I posted an image of a plane on Facebook and Instagram, and the background was nearly white. I began to think about that in relation with the following image. With this image, Resurgence was in front of an open hangar door, in beautiful overcast light and the inside of the hangar was in shadow. I figured that if I burnt down the background I would have a beautiful shot that looked like it was done in a studio. Ecstatic with the results, I wondered if with a little playing around in Photoshop, I could get the on white look with cars and planes. I started with the following shots. The pavement behind the hangars at WAAAM is very bright and I determined that if you make a shot against their white, corrugated steel hangar walls, you would be well on your way to a white background shot. Unfortunately, I never liked that shot until I thought of this idea, so I had few shots to play with. The next step in Photoshop is to go into the Channels palette and pick the channel with the most contrast between the subject and background. Then, make a copy of that channel. Edit the levels on that channel to accentuate the contrast. Then click on the thumbnail of the channel while holding CTRL, this creates a luminance based selection. Invert this selection to select the vehicle instead of the background. Next, turn off the visibility of the copied channel and reselect the composite RGB channel as your active channel. Go back to the layers palette and enter the refine edge dialog. Clean up the selection as much as you can here and export the results as a new layer with a layer mask. Now, with the underlying layers’ visibility turned off use your paint brush to refine the mask. Then create a layer between the original and the one with the vehicle masked out and fill it with white. This essentially finishes the process. On the Waco YPF image, I also applied a surface blur to the shadow to get rid of the concrete texture. Important lessons were learned in this process. I had earlier discussed with some folks at WAAAM that they felt images of their vehicles on white would be really cool. I said of course it would be possible, but quite a challenge. This experiment tells me that it would be easier than I originally envisioned. The results would be better if some equipment was rented; an actual white background, scrims to create clean reflections on shiny surfaces, etc. It can be done outside though, this goes along way to making it easier than I originally thought. Plus the method, outlined here can work, with the biggest challenge being catching ugly reflections in the shiny surfaces of the vehicles. Click here to see these white background images closer, here to see the originals. Also take a look at my automotive, or aviation portfolio. Please contact me with any questions, or if you’d like me to do some photographic work for you. October’s Second Saturday at WAAAM was Roaring Twenties day, but there was plenty of other things to fascinate. One of the items that really excited me was a rat rod that was on display. 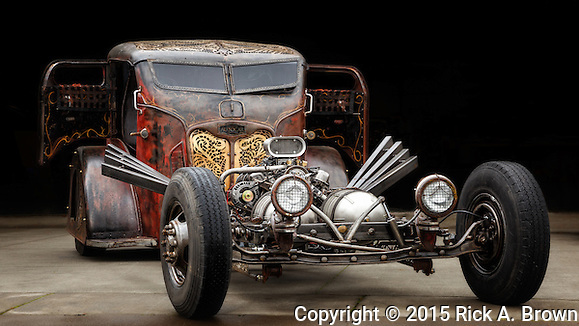 It won the Rat Rod Magazine, build-off, the second in a row for the builder. It fascinated me in its oddity and the imagination shown in how to build an automobile in an unconventional way. Furthermore, rat rods definitely have a rustic look I always find fascinating. To better show what I find fascinating about the rat rod, I used the post processing method I’ve talked about many times here. I look forward to hearing your opinion of the results. Another thing fascinating thing at this Second Saturday was the tour of the restoration shop, focusing on the restoration of the Waco 9. This plane will most likely be the oldest airworthy Waco when completed. The folks at WAAAM are really perfecting their tours of the restoration hangar and they get more informative and exciting every time. The final thing of fascination that I’ll discuss here today is they parked the L-birds they were flying that day in a way that was perfect for a portrait of the two planes. It was almost like this was coordinated with myself or another photographer. Take a closer look at my October Second Saturday images. Hope to see you at the next Second Saturday! I was at the 2015 WAAAM Traffic Jam, when a car club arrived from out of town (I can’t even remember where.) Among the cars was a 1957 Buick Roadmaster. Right away, I knew this was a very special car and it did end up winning several awards at the show. While I was there I made sure I got a pretty good number of images of this auto. At that time I was processing most of my automobile and airplane shot through a Lightroom preset that brought the highlights down, the shadows up, and applied a lot of clarity. This preset tended to accentuate reflections and while I was working on these images, I became very disenchanted with how this made the paint job look. It pretty much ruined the color of it. 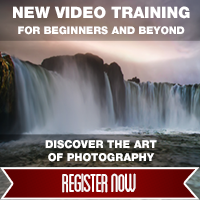 So, I decided to change my method to something more like that taught by Tim Wallace at KelbyOne. This post method is pretty basic as an overall treatment to the image. Then apply a considerable amount more clarity with the brush, to the grill, headlights, and other like items on the car. Sometimes, I even add some Tonal Contrast from Nik Software, Color Efex Pro4. I am happier with this method. Not adding clarity to most of the automobile has the paint job looking much nicer. I do add a slight amount of clarity to airplane images overall, but a small amount that I add to most images that I make regardless of the subject. I suggest you take a look at Tim Wallace’s classes for more information. Please take a look at the rest of my 2015 Traffic Jam pics, and my automotive portfolio. It may not be Darwinian, but a photographer’s style evolves over time. Sometimes it is intentional; the photographer will pay attention to what works in the marketplace, filtering that through what excites him, altering his style. Further, if he’s really working at this he will continue to learn new things. Finally, there is unintentional evolution; it may be subtle, but the way the photographer looks at a subject will change over time. I have created two galleries here displaying some evolution in my shooting. Both are connected to my attempts to pay homage to George Hurrell, a Hollywood photographer from the past. The above gallery is my earlier attempt and the bottom is some very recent shooting. Of course, I must also credit the help of Sami Van Der Westhuizen (the model), Carrie Strahle (makeup artist) and WAAAM (the museum that owns the planes) for having an impact on the second set of images looking different than the first. Please take a look at my portfolio.